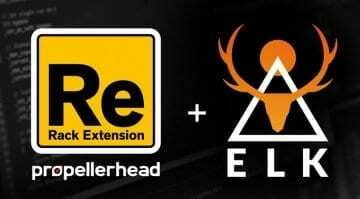 When Mind Music Labs and Propellerhead announced they were working on releasing Rack Extensions into the ELK music OS on hardware I was a bit sceptical. Mainly because MML had been talking about this at last years show and yet there didn’t seem to be any actual hardware out there running their OS and there hasn’t been any since. Well, this time around they had something very interesting to show that raises a lot of questions. The idea is that the ELK Music OS allows you to run VST plug-ins and now Rack Extensions on general purpose ARM and Intel-based cell processors. This means you can stuff it inside a small and cheap piece of computer hardware and run it as a standalone thing – in a nice box. Awesome! But examples of this actually happening have been largely non-existent – until now. 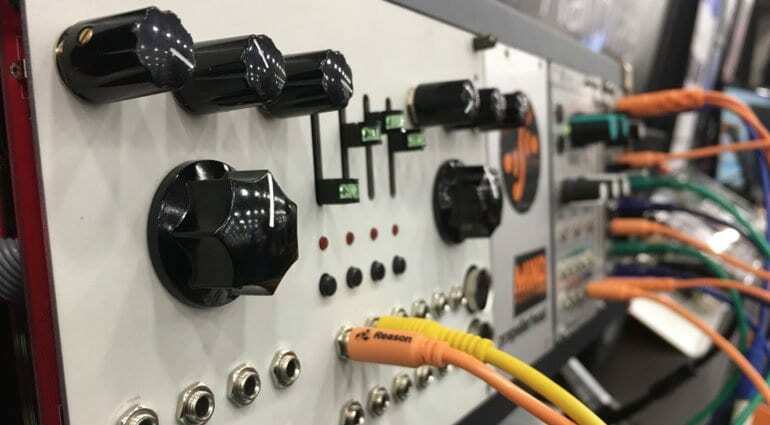 At NAMM they were showing a prototype Eurorack module with a general purpose processor that was running a Propellerhead synthesizer Rack Extension. The prototype module appears to be a “catch-all” device with two sections of 1 big knob and 3 little knobs either side of 4 sliders, 4 buttons and a dozen or so CV patch points. There’s also MIDI on it. So you can imagine it having suitable controls for pretty much any kind of synth or plug-in. In the demo video (below) they played it from a Keystep via CV and the performance and latency appeared to be excellent. Then they went into detail of how awesome it is to be able to control this “digital” module from another “analog” module, crossing the world of analog and digital systems (that’s adorable and kind of the point of Eurorack). Whether something is digital or analog in the Eurorack space is largely irrelevant, the concept is no longer interesting. What is interesting is how modules interact with each other. 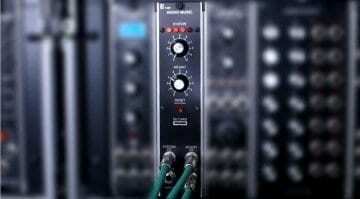 So we get that the Rack Extension can be modulated by an analog module but what can Rack Extensions and the ELK prototype module offer us in Eurorack? That’s the sort of thing I’d like to know. Well, there are 500 Rack Extension plug-ins that will run on the ELK hardware – awesome. Mind Music Labs seem to be about getting other people to build things with their OS. They suggest that hardware manufacturers could build a module or synthesizer that can leverage the hundreds and thousands of plug-ins that are out there. So in many ways we are back to the V-Machine or the Receptor idea of hosting plug-ins on hardware. But the Receptor came about at a time when computer power was mediocre and unreliable. These days no one thinks twice about taking laptop or iPad on stage and has masses of hardware control in their MIDI controller. Although off-loading plug-ins to hardware is still a useful thing. And then there’s the problem of installation and authorisation. How do you get your plug-in onto the hardware? What if it requires a dongle or online authorisation? How is copy protection dealt with? It says on the website that you simply recompile in the ELK format – presumably, we’re talking about plugins with single DLL files, not ones that have masses of other installation files all over the place. I get the sense that Music Mind Labs are really talking to developers and manufacturers rather than us end users. You’ve also got the added cost of the plug-in on top of the hardware where you might pay £250 for the module and then another £200 for Arturia Pigment to run on it – that’s coming up near the price of a real synthesizer like the Minilogue XD. On the other hand, if you’re a plug-in or software synthesizer manufacturer then the idea that you could make some custom Eurorack modules to run a version of your software is pretty darn awesome, and perhaps that’s a better angle. Like MOK has done with the Waverazor oscillator running on the 1010Music module. Maybe there’s an avenue for bright sparks to DIY their own synthesizers and use open source or freeware plug-ins inside. 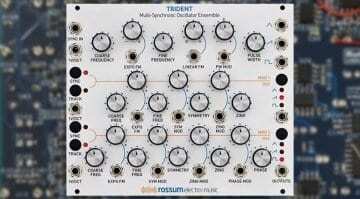 Could I make my own range of Eurorack modules using their OS and borrowed plug-ins? Or perhaps there will be a race to build the most generic possible module to capture the most possibilities? But then is a generic design any better than a laptop and MIDI controller? It’s very interesting and I’m arguing with myself about it. For me the advantage of plug-ins is the complex visualisation of music data and manipulation and the integration directly in my recording environment. The advantage of hardware is the simplicity and direct control of parameters. These two are not necessarily compatible. It’s not like UAD where you still have the plug-in interface and integration while running on DSP, this is putting the plug-in behind a bunch of knobs with no other visual feedback – unless of course, you build in a screen I guess. But I love the idea that I could take something like a Raspberry Pi and turn it into a Eurorack module running Unfiltered Audio Sandman – could I do that? Is that how it works? Lots of questions. It’s going to be interesting to see how it develops. What do you think? I couldn’t agree more, but i’m looking into it deeper to see what occurs.